The following is excerpted from the ONE YEAR DISCIPLESHIP COURSE (with an additional lesson from Romans 15 and 1 Corinthians 10. 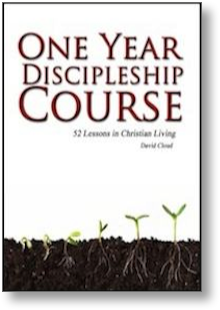 This course features 52 lessons in Christian living. It can be broken into sections and used as a new converts’ course, a discipleship course, a Sunday School series, a Home Schooling or Bible Institute course, or for preaching outlines. The lessons are thorough and practical. There is an extensive memory verse program built into the course, and each lesson features carefully designed review questions. Following are some of the lesson titles: Repentance, Faith, the Gospel, Baptism, Eternal Security, Position and Practice, the Law and Grace, Christian Growth and Spiritual Victory, Prayer, the Armor of God, the Church, the Bible, the Bible’s Proof, Daily Bible Study, Key Principles of Bible Interpretation, Foundational Bible Words, Knowing God’s Will, Making Wise Decisions, Christ’s Great Commission, Suffering in the Christian Life, The Judgment Seat of Christ, Separation - Moral, Separation - Doctrinal, Tests of Entertainment, Fasting, Miracles, a Biblical Testing Mindset, Tongues Speaking, the Rapture, How to Be Wise with Your Money, the Believer and Drinking, Abortion, Evolution, and Dressing for the Lord. 8.5X11, coated cover, spiral-bound. 221 pages. There is a lot of confusion about the law of Moses and what place it has in the Christian life, and it is essential for every believer to settle this issue on a solid Scriptural footing. 1. The law of Moses or the Old Covenant was given to show men that God is holy and that they are sinners (Romans 3:19). Men naturally think that they are righteous. They compare themselves to human standards of righteousness and one with another rather than with God’s perfect law. Men need to see that by God’s standards we are all sinners because we have broken His laws. Take the Ten Commandments, for example (Exodus 20:1-17). Men have broken all of these. We have put other gods before the one true God (Ex. 20:3). We have made idols and worshipped them (Ex. 20:4-5). We worship and serve ourselves more than God, thus making our own selves into idols. We have taken the name of the Lord in vain (Ex. 20:7). We have broken the Sabbath and treated all days the same, neglecting to set apart even one day for the worship of God (Ex. 20:8). We have dishonored and disobeyed our parents (Ex. 20:12). We have killed (Ex. 20:13). We have committed adultery (Ex. 20:14). We have stolen (Ex. 20:15). We have lied (Ex. 20:16). We have coveted (Ex. 20:17). The law of Moses requires perfect obedience (Deuteronomy 27:26). To break one law is to break all (James 2:10). Christ taught that God not only requires perfect external obedience to the law, but internal obedience as well. Before God, to hate my brother is murder (Matthew 5:21-22), and to lust after a woman is adultery (Matthew 5:27-28). Thus it is obvious that we are all guilty of breaking God’s law and are sinners in His sight. 2. The law of Moses cannot bring salvation (Romans 3:20). The Old Testament cannot bring salvation because it requires perfect holiness, whereas man is a fallen sinner and cannot live up to its requirements. Thus, the Law of God can only curse us. The word “justified” means declared righteous by God. God cannot declare a sinner righteous on the basis of the law of Moses, because it requires perfect obedience. 3. Salvation is through faith in Jesus Christ (Romans 3:21-24). The way of salvation is not through the law of Moses, but through Jesus Christ. The law demanded that the sinner die, and Jesus died in our place (Romans 6:23). The law demanded that blood be shed, and Jesus shed His righteous blood in payment for our sins (Hebrews 9:22). Because of what Jesus did on the cross, the believing sinner can receive the very righteousness of God through faith (Rom. 3:21-22). The believer is justified freely. This means that salvation is a gift of God that was purchased by Christ. We are redeemed by His blood. The word “propitiation” means satisfaction of a debt, and that is what Jesus did for us. He paid a price He did not owe to satisfy a debt we could not pay. 1. The law is not the Christian’s rule in life (Romans 7:1-2). Christ is our new husband and Lord, and He rules our lives through the New Covenant. Our rule in life is not the Law of Moses but Christ as revealed in the New Testament Scriptures. Trying to serve God under the old Law is like a woman who serves a husband only out of fear. She cooks and cleans house because she is afraid not to. Serving God under the new Law is like a woman who serves a husband out of love. She cooks and cleans house for her master, but not because she is afraid of what he will do to her, but simply because he loves her and treats her so well and she, in turn, loves him. 2. The Law of Moses cannot condemn the believer (Romans 7:3). The believer is as dead to the law as a wife is to a deceased husband. The Lord Jesus Christ took our condemnation upon Himself on the cross, and we are safe in Him from all fear of eternal judgment. 3. The Christian has a new power, which is the indwelling Holy Spirit (Romans 7:6; 8:1). The believer serves Christ through the Spirit, not through his own strength. Compare Galatians 2:20. This passage contrasts the Old Covenant with the New. 1. The Old Covenant was the law of Moses (2 Corinthians 3:7, 13). It was “written and engraven in stones.” That specifically refers to the Ten Commandments (Deut. 4:13; 5:6-22). 2. The Old Covenant was a ministration of death (2 Corinthians 3:7) and a ministration of condemnation (2 Cor. 3:9). This is because it required perfect obedience from the heart, and we being sinners are incapable of providing this level of obedience. 3. The Old Covenant has been done away in Christ (2 Cor. 3:11). It is not the believer’s rule of life. 4. The believer has a new law (2 Corinthians 3:17-18). The fact that the believer is not under the law of Moses does not mean that he doesn’t have a law. In fact, the believer has a higher law, which is the law of Christ. We are to be conformed to His image (Romans 8:29). As we see Him in the Scriptures, we are changed to His image. 1. The law of Moses, or the Old Covenant, required perfect obedience in all things; men, therefore, cannot be saved by it (Galatians 3:10-12). Because it requires perfect holiness, it can only bring a curse upon a fallen sinner. We cannot live up to its holy requirements. 2. Christ took the punishment demanded by the law (Galatians 3:13). He died in the sinner’s place in order to provide us with eternal salvation. 3. The law of Moses is our schoolmaster to lead us to Christ (Galatians 3:24). This is the major purpose of the law. It is designed by God to show the sinner his fallen and lost condition and to lead him to faith in Christ. 4. The believer is not under the law of Moses as a rule of life (Galatians 3:25). The believer’s law is not the law of Moses. The believer has a new law, which is the law of Christ. This means to be conformed to His image. The believer’s new law is also called the law of the Spirit (Galatians 5:16-18). By walking in the Spirit, which means obeying the Spirit and yielding to Him, the believer does not fulfill the law of the flesh. 1. Christ took away the Old Covenant, or the law of Moses (Colossians 2:14). He did this by fulfilling its demands and paying the price that we owe for breaking it. 2. The believer does not follow the Old Covenant (Colossians 2:16-17). The law contains types and shadows that point to Christ, but the believer has Christ Himself. Though the law of Moses is not the believer’s rule of life, it is an important source of instruction for the Christian life. We learn from its examples. We draw spiritual lessons from it. In 1 Corinthians 10 Paul draws lessons from Israel’s wilderness wanderings from Exodus and Numbers. We learn lessons about Christ (as the Rock and the living water), and we are warned not to commit idolatry and fornication or to murmur against God. The New Testament is filled with such lessons from the law of Moses. In 1 Corinthians 5 Paul draws lessons from the passover. In Hebrews 3:7-13, the writer of Hebrews draws lessons from Israel’s unbelief and hardness of heart in the wilderness. We interpret lessons from the law of Moses by comparing Scripture with Scripture to see if the lessons are supported by the rest of Scripture. Consider Deuteronomy 22:5, “The woman shall not wear that which pertaineth unto a man, neither shall a man put on a woman's garment: for all that do so are abomination unto the LORD thy God” (Deut. 22:5). This contains a moral principle that there should be a distinction between the sexes even in how they dress. That this principle remains valid in the New Testament dispensation is clear by comparing Scripture with Scripture. The teaching of Deut. 22:5 is confirmed in Genesis, where we find that God made man male and female (Gen. 2:27). And it is confirmed in 1 Corinthians 11:3-15 where we find that the sexes are to be distinguished by their hair length. Consider Leviticus 19:28, “Ye shall not make any cuttings in your flesh for the dead, nor print any marks upon you: I am the LORD” (Lev. 19:28). This moral lesson of avoiding pagan customs such as tattoos that are associated with idolatry and moral reprobation is confirmed in passages such as Jeremiah 10:2; 1 Corinthians 10:20-22; 2 Corinthians 6:16-18; and Ephesians 5:11. 2. What is the purpose of the law of Moses? 3. What verse says that to break one of God’s laws is to break all of them? 4. In what book and chapter does Jesus say that to hate is the same as murder and to lust is the same as adultery? 5. Why can’t men achieve salvation through the law of Moses? 6. What verse says that without shedding of blood is no remission of sin? 7. When the Bible says the believer is justified "freely," what does this mean? 8. What is the believer’s rule in life? 9. Why can’t the law of Moses condemn the believer? 10. What is the spiritual power by which the believer serves God? 11. What was the Old Covenant? 12. What does Paul refer to when he writes of that which "was written and engraven in stones"? 13. Why is the law of Moses a ministration of condemnation and death? 14. What are three names for the believer’s law? 15. What type of obedience does the law of Moses require? 16. The law of Moses is our _______________ to lead us to Christ. 17. What is the major purpose of the law of Moses? 18. What is the law of the Spirit? 19. In what sense did Christ take away the law of Moses? 20. The law of Moses contains _______ and ___________ that point to Christ. 21. What are two New Testament passages (book and chapter) that say that the law of Moses contains lessons for the Christian life? 22. By what principle do we interpret lessons from the law of Moses? 23. How do we know that the principle of maintaining a distinction in how males and females dress from Deuteronomy 22:5 applies to the Christian life? What are two other passages that confirm this? 24. How do we know that the principle of avoiding pagan customs such as making marks and cuttings in the flesh applies to the Christian life?